We have continued our partnership in 2019 with H&R Block® to make filing your taxes as easy as possible! Make sure you have all of your income statements (typically W-2 and 1099 forms). If you earned 1099 income in 2017, you will have received one or both of these forms: a 1099-K, and a 1099-MISC. You’ll need to have these income totals ready when you report your income. However, if you didn’t receive a 1099-MISC, you may still have income to report! Many companies only sends a 1099-MISC reporting incentive and referral income if you made at least $600. In the case of Uber, even if you didn’t receive one, you should check your Uber Tax Summary to see if you received any of this type of income. On your Uber Tax Summary, you’ll see under the “1099-MISC Breakdown” whether you have income to report in addition to the income on your 1099-K. Find this total and have it ready. If you’ve tracked your business expenses, then you’ll want to have all of your documentation at the ready when you go to file. After you’ve gone through your records, you should know how much you spent on passenger goodies, how much you spent on your cell phone bill (and what percentage of of the bill was due to business), how much you spent on parking, etc. Haven’t been tracking your deductions? Don’t worry, you have a few options. Mileage: When it comes to mileage, you can start with your on-trip mileage. Here’s a guide on how to take that mileage and find your total business mileage from the past year. Expenses: As for expenses: It’ll take some work, but you can still find your business deductions by going back through your records. The absolute best form of documentation for your expenses would be receipts from the purchases. If you’ve been keeping receipts, it’s time to dig them up and tally up your deductions. Another way to document your business expenses from the year would be to go through your bank statements, find your business purchases, and then take good notes on what was purchased, what it was used for (as well as notes on if and how the purchase was also used for personal reasons). If you use Stride Tax, you should be able to use your exported deduction report. If you missing expenses, you can always link your bank account and go back through your records for the past year (depending on your bank). You’ll also be able to add in detailed notes on each purchase. 1. Enter income: In the “Income” section of the H&R Block software, you’ll be asked a few simple questions about the income that you received in 2017. If you only drive for Uber, then you can label your business as “Uber driving” or something similar. If you drive for multiple rideshare services, it’s best to label the business as “Rideshare driving,” or an equivalent. You’ll choose your “business activity code” based on the kind of work you do. H&R Block will give you some suggestions, but you can view a full list by clicking “My business isn’t listed here”! When you’re self-employed, much of your business information is the same as your personal information (legal name, address, and social security number). This question is referring to employees besides yourself! As a rideshare driver, your rideshare business would not have an EIN. On this page of classifying questions, the only question that would apply to rideshare driver is whether or not the business was started in 2017. If this is true, select that option. If you’ve been driving before 2017, you can leave this page blank. Uber and Lyft drivers: You use the cash method! 8. Choose whether or not you are exempt from self-employment tax (you probably aren’t). It’s very rare that a rideshare driver would be exempt from self-employment tax; the exemption is only available to workers in certain industries (which doesn’t apply to rideshare), and to certain nonresident aliens. 9. Mark whether you materially participated in your business. Uber and Lyft drivers: You did materially participate! You will have received either a 1099-MISC, a 1099-K, or both for your rideshare work. Select the relevant forms of income. 11. When reporting your 1099-MISC income, enter the income from Box 7 of your 1099-MISC (if you didn’t receive a 1099-MISC, then you can skip this step). 12. 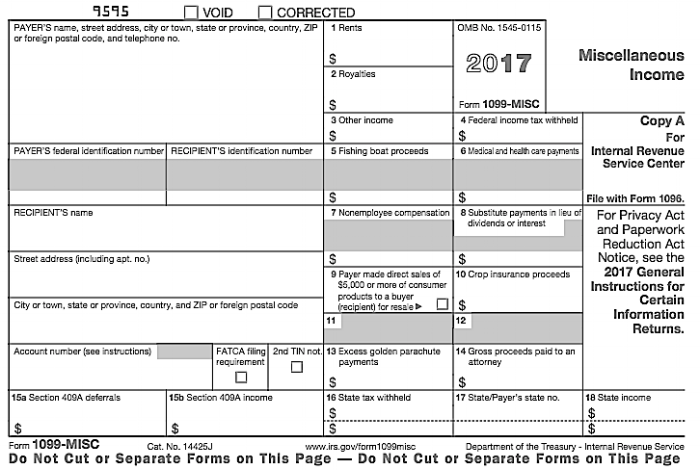 When reporting income from your 1099-K, enter the amount of income from Box 1a of your form. Tip: Be sure to check if any amount of this income has been withheld. It’s rare, but possible that some of your income has already been withheld for you. The amount of withheld income will be stated in Box 4 of your 1099-K.
14. Mark what kinds of business expenses you had. As a rideshare driver, you will almost always qualify to deduct car and truck expenses (the exception being if you rented a car to drive), and “general business expenses,” since you’ll deduct Uber or Lyft fees. Food that you shared with a potential referral, or food that you purchased when you were out of town can be deducted at a 50% rate! If you’re a Stride Tax user and have exported your reports, your deductions will be automatically organized to fit into these deduction categories! 16. Using your Uber Tax Summary, enter in the amount of Uber fees that were deducted from your pay. 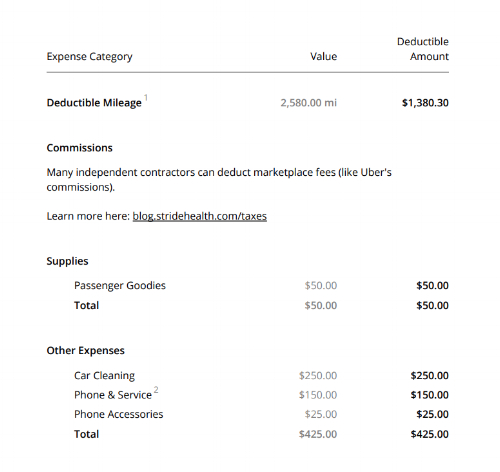 Anything listed on that document that isn't "Gross Fares," "Referral / Incentive" income, reimbursements, or money that you received in exchange for services is deductible! This includes the Split Fare Fee, Safe Rides Fee, Airport Fee, Uber Service Fee, and other fees and charges that weren't income to you, but are included in the income number listed on your 1099. You’ll be asked about the make and model of your car, as well as how many months you used your car for business, whether or not you own the car, and how many cars you had at your disposal. 19. Enter in your business miles, and your total miles. You can leave the “commuting miles” box blank if your car wasn’t used for commuting. You’ll probably get a higher deduction with the standard mileage rate, but if you’d prefer to use the actual expense method, you can do so here. When you use a personal car as an Uber driver, you may be able to deduct related expenses using one of two methods: the standard mileage rate method or the actual expense method. To use the 2017 standard mileage rate of 53.5 cents per mile for a car, the you must choose to use that method in the first year the car is used in a business. Use of the business standard mileage rate is in lieu of claiming actual fixed and operating costs of using the auto for business. This means items such as depreciation, maintenance (including car washes), repairs, tires, fuel, oil, insurance, and registration fees are included in the mileage rate. However, using the standard mileage method generally can still separately deduct: tolls and parking fees, auto loan interest, and personal property taxes. If you do not, or cannot, use the standard mileage method you will deduct the actual expenses of operating the car. These expenses include: depreciation; lease payments; registration fees and licenses; insurance; gas, oil, and repairs; garage rent; tires; and tolls and parking fees. The expenses for a car used for both personal and business purposes must be divided between the two uses. The expenses are prorated based on the miles driven for each purpose. If you do not either own or lease the vehicle you must use the actual expense method to report vehicle expenses. Also, if you operate 5 or more of cars in this activity you must use the actual expense method to report vehicle expenses. When you use your personal car to drive for Uber, certain expenses must be allocated between business use and personal use; you'll need to find the percentage of time that your car is used for work. You'll use that business percentage to determine how much of your vehicle expenses you can deduct (for example, if you use your car for work 60% of the time, you can deduct 60% of your vehicle expenses). You can find this percentage by dividing your total number of business miles for the year, by your car's total number of miles. For example, if you drive 20,000 miles in a year in total, and 10,000 of those miles were for work, then you can deduct 50% of your vehicle expenses. *Expenses that are covered by the standard mileage rate, and therefore not deductible in addition to the amount deducted based on that rate. If you purchased an item that has a useful life of more than 1 year, then you’ll need to depreciate it as a business asset. These assets may include a new cell phone purchased specifically for rideshare driving, or a dashcam to be used when you’re on-duty. Enter the name of the asset, classify what kind of asset it is, and answer the questions about your usage, when you bought it, how much you paid for it, and which depreciation method you want to use. If you’re looking to depreciate a cell phone and need to calculate what percentage of the time it’s used for business, then you can take a look at your cell phone records! If you use your phone about the same amount each week or month that you drive, then you can take what you consider to be a typical week or month, figure out how much of your calls, texts, and data usage was for business, and then apply that average percentage to the rest of your working time.